User Behavior Affects Local Rankings. Now What? First, go check out Darren’s slides. After you pick up your jaw, come back here. The two presentations were an unofficial duo that kicked off the Local track at State of Search 2014. Want to know how to get higher click-through from the Places results, and how to encourage other actions that Google may care about (like getting customers to look up driving directions)? Enjoy! Huge thanks to Greg, Mike Stewart, and to everyone else who made State of Search great. You should go in 2015. You’ll love it – especially if you’re serious about local search. Questions about my slides? Leave a comment! A few days ago, I asked the good people on my email list to send me their questions. They’ve always sent me great questions, and I always take a crack at them. But local search – and Google+Local in particular – is as messy and complex as ever. Sometimes it helps to see a bunch of questions other people have, and the answers to those questions, all at once. I like the Ask Me Anything rounds that some SEOs do. Same idea here. So, I received a ton of great questions from business owners and marketers/SEOs alike. Some of the questions almost call for a whole blog post to answer, but I’ve tried to give quick answers – hence the “lightning round” part. But there are so many questions that this has turned into the most epic post I’ve done yet. I’m going to focus on the “improves” part of your question: I’d say businesses see the most improvement when they clean up all their citations. Indirectly, maybe – but only to the extent that they’re a catalyst for things that can directly help your rankings, like unstructured citations or maybe links. Facebook activity seems to be a major factor for Bing, though. I’m sure things like Google +1s and Circles will start counting for more in the near future, but they don’t seem to at the moment. I’ve had clients who rank tip-top in Google but not so well in Bing. The fundamentals are the same (e.g. consistent citations, on-page factors). But things like Facebook activity and Yelp reviews seem to matter more in Bing. Overall, I’d say Bing is a little easier, but if you’re ranking well in Bing, you’re probably on the right track with Google. My favorite cocktail: a combination of the Local Citation Finder, GetListed.org, and my definitive list of local citations. (1) Get more reviews, on as many sites as you can. Never stop. (2) Get citations from sites specific to your industry. (3) Add as much additional info (e.g. descriptions, photos, etc.) as you can to your listings on those citation sources. (4) Blog – the right way. (5) Think of a small (or larger) “local event” you can host. Don’t neglect your Google+Local page, citations, reviews, etc., but start going more after organic rankings for those search terms that aren’t returning the Google+Local (AKA “maps”) results. Start by fixing your listings on ExpressUpdateUSA.com, LocalEze.com, MyBusinessListingManager.com. Those take the longest to digest updates, so you’ll want to fix them ASAP. Then do CitySearch, YP.com, and Yelp (if possible; it’s not always). Then move on to your other citations, referring to my list, and/or with the aid of Nyagoslav’s excellent guide to citations. No. This isn’t an approach I’d suggest. I haven’t seen forwarded domains in the search results recently, so I’m not even sure Google will rank the forwarded domains at all. (If someone has a definitive answer to this, please chime in!) But it’s almost certain not to work in a market that’s even a little competitive. Having a search-term-relevant domain alone just isn’t enough. Probably your best bet (1) to start doing AdWords, (2) or to create some pages (on any of your domains) that are geared specifically toward patients in that nearby city. No. You can have separate websites for each city, but in most cases I wouldn’t recommend building them, because it’s hard to do so without being spammy. You’re probably better off creating unique pages on your current site for each city (see previous question). 1. Which specific pages are outranking yours, and for which search terms? 2. How do their pages differ from yours? Do they have a lot of meaty, useful, on-topic information on the pages that are ranking well – whereas maybe you only have a paragraph? Try to compare apples to apples. 3. Do your pages seem significantly more “SEO’d” than your competitors’? If you’ve got spun content, exact-match anchor text out the wazoo, keywords stuffed into every nook and cranny of your site, etc., then your competitor may be outranking you simply by not making rookie mistakes. 4. What do you see when you do an OpenSiteExplorer checkup on them? 5. How unique and helpful are your competitors’ pages? There’s not much of a “trick.” Just specify them on your Google+Local page, onyour Bing Places listing, and on your third-party listings. Follow Google’s guidelines and my best-practices for categories. Yext is good in certain situations. But you’re right that you also need to do at least some manual tuning-up of your listings. No tool eliminates that necessity. Totally depends on how competitive the local competition is for those search phrases. It can take months and months. It’s pretty much always the case that “keyword” has more search volume than “keyword + city.” But you shouldn’t be using different strategies to get visible for each type of search term. If you rank well for “keyword + city,” you’ll usually also rank well when people in that city just type in “keyword.” Google will show those people local-biz results that it deems to be local. So the name of the game is to make it abundantly clear to Google what city you’re located in. Sometimes it’s possible to appear for statewide search terms (e.g. “dentists MA”) in the Google+Local results. This great old post from Mike Ramsey explains it nicely. But you’ll probably have better chances of ranking for statewide searches organically. Are we ready to terraform Mars? Have we built a Commander Data? No…Google still hasn’t finished the transition from Google Places to Google Plus. Not to my knowledge. I’ve noticed that businesses with “merged” pages tend to rank more highly, but I think that’s only because their owners tend to be proactive about their local visibility in general. So I’d say there’s correlation but not causation. If they are legally separate businesses, then you’re taking the right approach. They’ll need separate phone lines, DBAs, and websites – but this is a matter of course if in fact they’re legally separate businesses. I believe the protocol du jour is for you to edit your address to the new location. Mike Blumenthal has a fairly recent post with more detail. “The ‘city centroid’: Does this still carry a lot of weight in rankings? It depends on a lot of factors, but in general, not really. The main thing that matters is whether your business is located in (or extremely near to) the city you want to rank well in. Depends on what you mean by “outskirts.” If you’re in the ‘burbs, your best bet is to go after organic rankings. But if you’re truly located in the city proper, it’s still the same ballgame to rank well in the Google+Local results, and you probably won’t be at any disadvantage. You don’t. Using a forwarded URL shouldn’t be a problem as far as your citations are concerned, but that URL needs to match the URL of your Google+Local landing page – and Google will probably whack you for using a forwarding URL. If the website for the practice is strong (i.e. 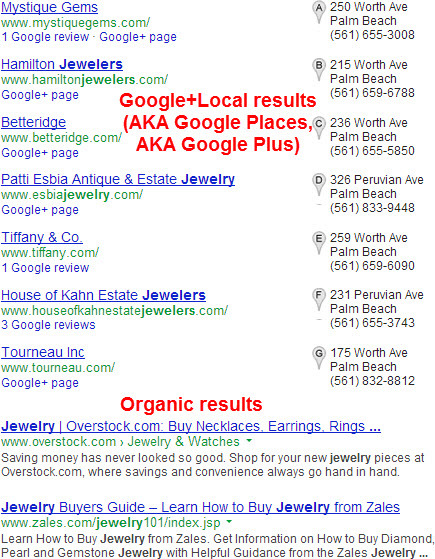 lots of relevant content, maybe some good links), probably both Google+Local listings are benefiting. If both listings have been around for more than a couple of years, there’s also a good chance that they both have consistent info on their citations. It may also help if both listings have reviews. Update your listings first, and then (once you’ve moved) update your Google+Local listing. Generally speaking, it’s best to use a different page of your website as the landing page for each Google+Local listing (that is, each location of your business). 1. Better tech support (in that now it exists). 2. New listing-manager rolling out. No need for you to do SEO differently. It’s still the same ingredients that go into the rankings burrito. You somewhat answered your own question: local rankings usually take a while. If you’ve truly got the citations under control – a big “if” – then I’d really suggest trying to get reviews on a diversity of sites (e.g. not just Google, not just Yelp, etc.). Beef up your third-party listings (AKA citations) with as much additional info on your services as you can. If possible, start blogging – but only if you do it according to Matt McGee’s suggestions. Update the business name on as many sites as you can, and as quickly as you can. Update your Google+Local listing, too. A good starting point would be to focus on the listings you see when you do a GetListed.org scan. Once you’ve done that, scour the Web for listings with the old name, and try to get those fixed or removed. Your rankings may very well take a hit in the short-term, but they should be fine in the long-term if you’re diligent about cleanup. Ask every customer for a review, make sure your third-party listings have plenty of info (e.g. descriptions, categories, etc.) on the services you’re not ranking for, and crank out some good blog posts or articles that someone looking for those services would find useful. Above all, take it slow and easy. You seem to be on the right track. Yes. Assuming you know for a fact that your listing is 100% kosher according to Google. If he has one location, then he can have one Google+Local listing (not 4), and he’ll have to “hide” his address. He may or may not actually rank well in all 4 cities – depends on a lot of factors – but if he’s met the two conditions I mentioned, at least it’s possible he’ll rank well in a good chunk of his service area (especially if it’s a rural area). Sounds like the listing has been pulled for a violation or due to a bug. Not much you can do about the latter. But if you suspect the former, read Nyagoslav’s great post on troubleshooting. No. It’s focused on “localized organic” rankings. Yes, each physical location can have its own Google listing – and each Google listing must correspond to a physical location, or you’ll incur the wrath of the Google Gods (and rightfully so). You don’t have to do a bulk upload. All the listings don’t even need to have been created in the same Google account. For instance, if it’s a franchise and each franchisee wants control of his/her listing, the listings can be created and/or claimed through different people’s Google accounts. There’s no way to do the citations “in bulk.” It’s number of locations multiplied by number of sites you want to be listed on. Ideally you have a separate landing page URL for each location / Google+Local listing; if that’s the case, then put that URL in the “website” field on each citation site. If they are two officially, legally separate practices, then you’re fine. But if it’s one lawyer who runs one practice but wants to have two Google listings for rankings purposes, then one or both listings may very well get penalized. Google seems to be phasing out custom categories. Still, custom categories can really help your visibility, provided you follow some guidelines. Your current setup sounds fine. I’d leave it as-is. You’re not going to hurt your rankings by adding relevant categories on the Google+Local side, but I wouldn’t say you need to. Google’s categories will be a mess – rather, a two-headed monster – for at least a little while longer. There’s nothing you can do to make more reviews stick. What you heard is correct. The best thing to do is to ask your customers up-front whether they’re already active on Yelp. Yelp doesn’t want you even asking – let alone encouraging – customers for reviews. So to the people you know to be active Yelpers, maybe you can suggest or intimate that you would not be entirely averse to their possibly considering posting a review 😉 For everyone else, I suggest you follow my “zigzag” approach. No, sad to say. See previous answer. CitySearch, InsiderPages, and Yahoo are my picks. If there are any sites specific to your industry, try to scare up reviews on those as well. Reviews are crucial, but other factors matter quite a bit. It’s not enough to have a “filled out” site. You also need to put a lot of elbow grease into citations, for one thing. Although sometimes local rankings are a game of inches, more often they depend on how well you apply the fundamentals. No idea. I’m not sure anyone knows. I do know that if you’re on AdWords Express and if you have Google+Local reviews from customers, the reviews will show in your ad. But AdWords Express isn’t as effective as classic AdWords, so it would be nice to see some integration there. I don’t believe that it does affect rankings – at least not directly. But having a mobile-friendly site may help indirectly, because visitors are less likely to bounce and are more likely to “engage” with your site and maybe share it socially. Those things can help your rankings. (1) See how many of your competitors are using it, and how many businesses like yours in other cities are paying for Yelp ads. That will give you a sense of whether anyone in your line of work might be making money from Yelp ads. (2) You’ll need to lay some groundwork first, by beefing up your Yelp listing as much as possible, applying at least a little conversion-rate optimization to your site (no point paying for ads that lead to a dog of a site), and doing what you can to encourage Yelp reviews. Never ease up in your efforts to get reviews from as many customers as possible, and from as many different sites as possible. 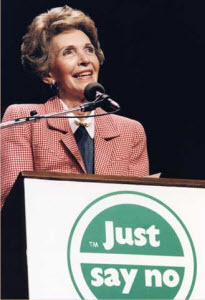 Make your site as “sticky” as humanly possible. Fill it with your knowledge. Also, I’m a huge fan of CrazyEgg and Qualaroo. Absolutely – assuming you completely stop the bad SEO practices that got you into hot water to begin with, and assuming you then make an effort to stand out in some way, be it through tons of reviews, tons of helpful and relevant info on your site, etc. It’s hard to know. Your site shouldn’t try to “make” people take action. It should answer their questions. That’s the most important thing. Aside from that, I can’t get into heavy-duty CRO here, but one piece of low-hanging fruit is to make sure you’ve got your address and phone number (and maybe email address) on every single page, above the fold. Also, as I mentioned before, CrazyEgg and Qualaroo are tools that can help you learn more about your visitors and tailor your site to their needs. Nah. 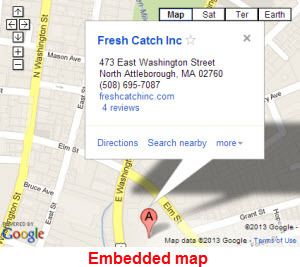 Embedding even a Google Map on your site isn’t necessarily “important”: it’s mostly a convenience for visitors, and it’s just another little way to convey to Google that you’re local. But no need to add a Bing or MapQuest map or whatever. No, although I do have a questionnaire (the second of two – here’s the first) that I ask my clients to fill out. I’m sure I could improve it, but it covers the bases pretty well. A rip-off. Just set up some Google Alerts and If This Then That alerts, and check on the main review sites from time to time. Sounds like a typical shenanigan. If you’ve never paid that site for advertising, there’s no way you’re on the hook for anything now. You’ll get a decent number of sales pitches when you list your business on a lot of these third-party sites. It may seem like a Faustian pact, but it’s a small price to pay for being listed on sites that, ultimately, help your local visibility. Huge thanks to everyone who sent in questions. You rock. Let’s keep it going: Do you have any quick questions for which you just need quick answers? Throw me a comment!